When you say “I do” you are launching into the broad horizon of new possibilities with the love of your life. What would be a better reflection of this new step than a backdrop of endless sky? A rooftop wedding might be the perfect setting for your destination wedding. If you’re not sure where to start looking, here are three of our favorite rooftop wedding venues along the Mexican Caribbean coast! A short drive down the Mexican coastal highway 307 you will find Azul Beach, a boutique-style property overlooking the gorgeous Caribbean beach. Including their promise of effortless relaxation, they are also the real deal when it comes to destination weddings! This AAA Four Diamond resort offers the Gourmet Inclusive Experience by Karisma, which serves you in crafting your dream (and stress-free!) destination wedding. You can choose one of their signature Memorable Moments themes or take a more hands-on creative approach. 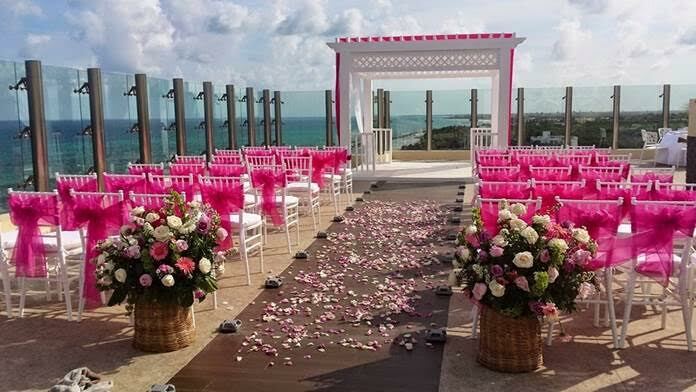 Then Azul Beach’s Sky Rooftop Terrace is there for you to elevate your wedding to another heavenly level. If you’re a foodie or someone who has special dietary needs (like gluten-free or vegan) you will also love Azul Beach. No other hotel chain caters to foodies or people with dietary restrictions like they do! Azul Beach offers 6 dining options to choose from, including the Agavero Tequila Lounge which serves over 30 different tequilas! The food offerings are super diverse, serving everything from North Italian, to Taiwanese, to Caribbean, and (of course!) authentic Mexican. And don’t worry about being bored at Azul Beach. Just a short drive outside this resort you can explore the nearby Mayan ruins, go snorkeling, play 18 holes of golf, swim with dolphins, and tons more. Then whenever you need some time to relax you can return to the resort’s spa for endless pampering or a romantic walk along the beautiful beach. All of the newly renovated rooms are just steps from the beach, pools, restaurants, and bars. Dreams Tulum Resort and Spa is perfect for couples seeking an affordable, relaxing beachfront venue for their dream destination wedding. Surrounded by acres of lush, flowering gardens Dreams Tulum is housed in Tulum, a town rich with history where you can visit magnificent colonial architecture or the ancient Mayan world of Chichen Itza. This resort overlooks the Riviera Maya, on sand so white it looks like sugar. Another AAA Four Diamond resort, Dreams Tulum offers all the luxury and accomodations you would expect. Eight gourmet restaurants with no reservations required. All suites offer a private and furnished patio or balcony with a hammock, marble bathrooms, daily refreshed mini­bar and 24 hour room service. There is even countless watersports and other activities to keep you busy. 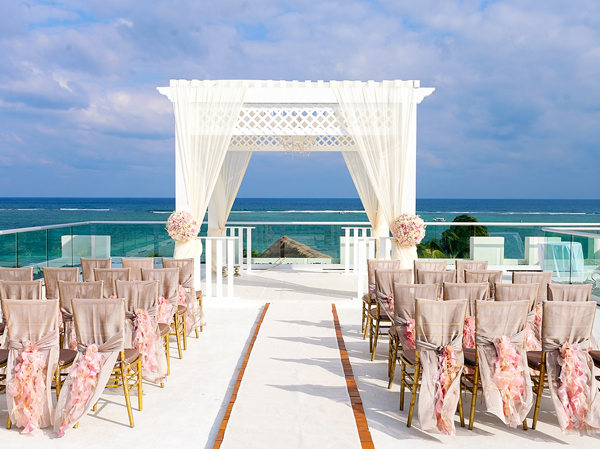 Dreams Tulum could be the perfect location for your dream rooftop destination wedding. Like Azul Beach, Generations Riviera Maya is an all-inclusive Gourmet Inclusive Experience by Karisma – and it delivers on the romance along with some impressive credentials and features. Beach butlers to cater to your every wish. Oceanfront views in every suite. Infinity pool and main pool with a swim-up bar. And of course a gorgeous rooftop destination wedding location! At Generations Riviera Maya there are 6 beautiful wedding packages to choose from, plus even more here! Then close by, there are a host of other fun attractions: the coastal resort town of Playa del Carmen, the Mayakoba championship golf course and Playacar Golf Club, and the port town of Puerto Morelos and downtown Cancun city. Your destination wedding should be a moment in heaven, no matter what the location. 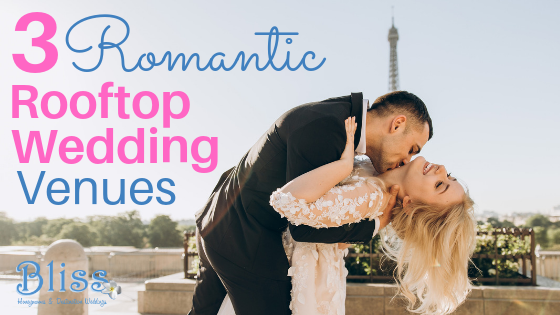 But a rooftop wedding venue can bring you just a little bit closer to the magic of your special day. Speak to our expert travel agents today for free if you are interested in exploring any of these options.